The 72mm 3-in-1 Rubber Lens Hood from Kaiser is designed for lenses with focal lengths anywhere between 28mm and 200mm (35mm equivalent). Because their flexible yet sturdy rubber construction allows them to fold in on themselves and hold that position, they are considered 3-in-1. When left in their unfolded, longest position they are compatible with telephoto or long zoom lenses. When folded in once, they work for standard focal length lenses and when folded back twice, they serve for wide-angle lenses. A metal screw-in mount firmly attaches them to 72mm diameter lenses and in their fully retracted position they can be kept on the lens permanently for added protection against bumps and scratches. Made from matte black rubber and with light baffles, they deflect stray light to keep your images free from light flares. The interior of the lens hood contains a filter thread for 72mm lens filters. These Kaiser lens hoods are an affordable and adaptable way to protect your lenses and an invaluable accessory when shooting in tricky light. Three-way adjustability for focal lengths between 28 and 200 mm. Blocks unwanted sunlight or other source light from entering lens and producing glare or lens flare. The sturdy but flexible rubber construction protects the lens from accidental impact. 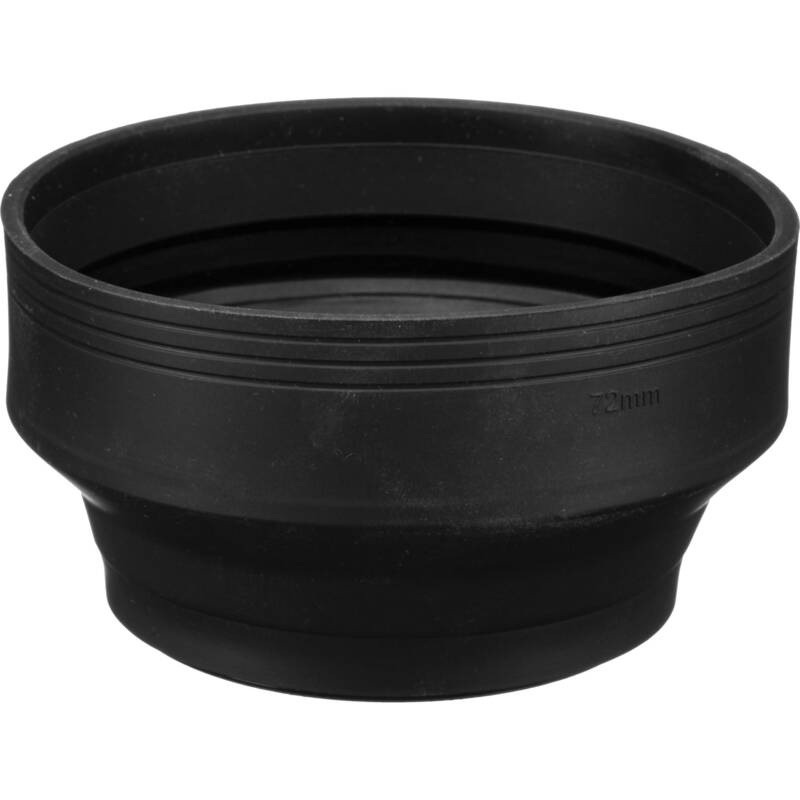 Box Dimensions (LxWxH) 7.9 x 5.1 x 1.4"
72mm 3-in-1 Rubber Lens Hood is rated 3.0 out of 5 by 1. Rated 3 out of 5 by QRK from Nice product Fits great on lens and is collapsible so you don't have to keep on mounting and in mounting. I gave it 3 stars because when fully extended it blocks the camera sensor rendering the remote control useless. Other than that, it works just fine. Will this hood fit on my Sigma 17-70mm f/2.8-4 DC Macro HSM Lens f/Sony? At full extended position, I noticed corner shadowing at the DSLR 40mm setting on my 40-150mm lens. I don't know if pulling it in would work for your wide angle positions or not.